Maidan could have set Ukraine's media free, but one year on, the press remains dependent on the oligarchs. One week later, Velichko himself repeated the charges made by Opposition Bloc. Using this online testimony, Kolomoisky allegedly engineered the sacking of the mayor of Dnipropetrovsk on grounds of corruption. No one knows what actually happened and no one is too keen to find out. This gangland story wasn’t hidden from the public and, apart from a few opposition TV stations (such as Inter and Ukraine), the press did not report it. For Ukraine’s Fourth Estate, covering this story made little sense: neither their investors, nor their political patrons were involved. The events of January and February 2014 may now be known as the ‘Revolution of Dignity’, but the latest economic crisis has made Ukrainian media even more dependent on handouts from individuals. And what’s more, they continue to operate in a less than dignified manner. July 2012. 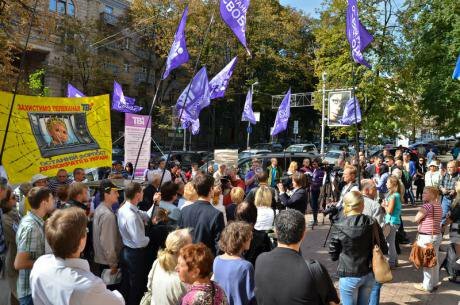 Supporters of TVi, a station critical of Yanukovych, gather to protest against a tax inspection raid at the station. During the crisis in March which led to the sacking of Kolomoisky as governor of Dnipropetrovsk, not a single central television station broadcast the whole truth about the situation with Ukraine’s state oil company. Those stations whose owners weren’t involved in the clash preferred to steer clear of the oligarch's squabble. 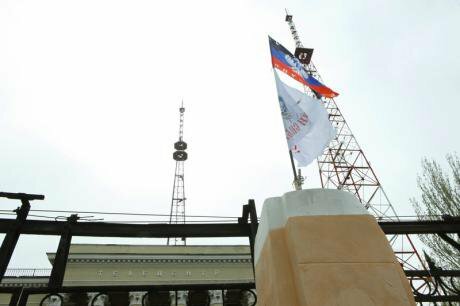 In April 2014, a group of pro-Russian soldiers occupied the headquarters of TV channel 27 in Donetsk. Kyiv has little chance of an open battle according to the rules laid out by Kremlin propaganda. 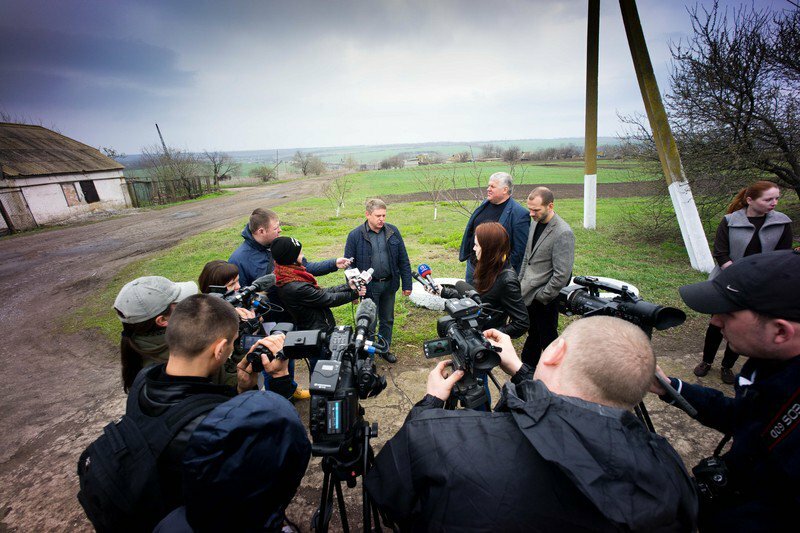 Standfirst image: A government official of the self pro-claimed Donetsk People's Republic speaks in front of local media, April 2015. (c) Geovien So / Demotix. Image one: Protest in support of TVi in Kyiv, July 2012. (c) Roman Pilipey / Demotix. 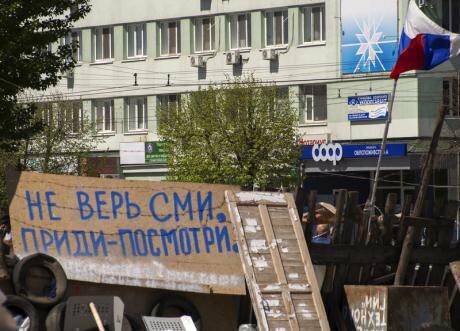 Image two: Sign near regional SBU headquarters in Luhansk, April 2014. (c) Igor Golovnoiv / Demotix. Image three: A group of pro-Russian soldiers occupy the headquarters of TV channel 27 in Donetsk, April 2014. (c) Cosimo Attanasio / Demotix.